White Katy photo tee with silver foil logo print on front only. 100% ring-spun cotton. Well this is the best t shirt ever! When I go to Katy's Tour in Barcelona i bought it and the quality is very good and the design is fantastic! I love it,its my favourite T-shirt ever! I love the T-shirt and Katy Perry! Right when I saw this shirt, I knew it had to be mine! I wear it all the time, and is one of my favorite shirts!! Katycat for life!! The xs was a little big for my size, 115 pound girl but great material I'm in love with the shirt! 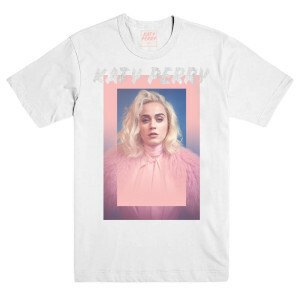 Any shirt with Katys face on it is great!